A common question I am frequently asked as a builder is “What is your price per square foot?” Well, that depends on a lot of factors, many of which are determined by the customer rather than the builder. The bottom line is that you get what you pay for and if the lowest price per square foot is really what you want, don’t expect much. Let’s talk about some areas that affect the price per square foot. I have seen two sets of plans with the exact same house square footage and grade of finishes cost up to a 500% difference to build. The first thing to look at is how many square feet are under roof. Two of the more costly areas of home construction are the foundation and roof systems. Therefore, a two-story home costs less to build than a rambler because it can have half the roof and foundation area. A 2,000 square foot two-story home with 1,000 square feet on the main level and another 1,000 directly over it would have half the roof and foundation as a 2,000 square foot rambler. Now, that all changes if there is a basement. The two-story home would have a 1,000 square foot basement with a total of 3,000 square feet and the rambler would have a 2,000 square foot basement and 4,000 square feet total. Since the basement already has a foundation and roof, it will finish for only 20-30% of the cost of the above grade square footage. If a fully finished basement is averaged into the total square footage of a home, the rambler then becomes less costly per square foot. 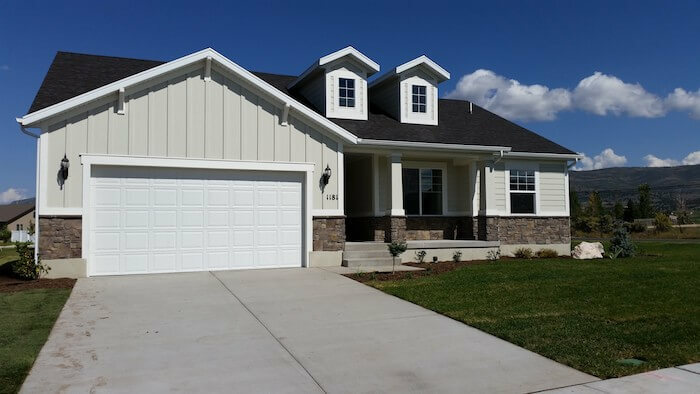 Other areas under roof that affect the cost and are not figured into the square footage are the garage, covered front porch and covered patio or deck. Two car garages start around 20’ x 20’ on the small side and my neighbor has a 28’ wide by 32’ deep two car garage. My personal home does not have a covered front entry but another neighbor has a wrap-around porch that is 10’ deep across the front of the home and down one side with a cold storage basement under it, and then extends to a 15’ deep Trex deck across the back of the home with a patio and a walk-out basement under it. These are expensive yet desirable items that are not part of the square footage of a home. The footprint of a home also has a big impact on building costs. A square box is the most cost efficient footprint and every jog and corner adds another element to the foundation and roof system. These jogs add to the curb appeal and cost but not to the square footage. The steeper the roof’s pitch the more it costs. A steeper roof has larger trusses, more sheathing and more shingles. It also takes much more labor, often requiring both the framer and roofer to be secured with ropes and harnesses for safety. The depth of the soffit or roof overhangs and the size of the fascia board are also considerable cost factors. The least expensive areas inside a home are large open spaces like living rooms, family rooms and dining rooms. Next are bedrooms which add the cost of doors, closet walls, shelves and rods. Then there are storage areas like linen closets, coat closets and pantries that have a high cost per square foot when factoring a door, shelves and often a light into a small area. Kitchens and baths are usually the most expensive areas inside a home because they add the cost of cabinets and countertops, additional lighting and electrical outlets, plumbing and plumbing fixtures, hardware and appliances. So those seeking the best price per square foot are asking for a home shaped like a box with a minimal roof pitch, small garage, no storage closets, few and basic baths, and a tiny kitchen with cheap appliances.